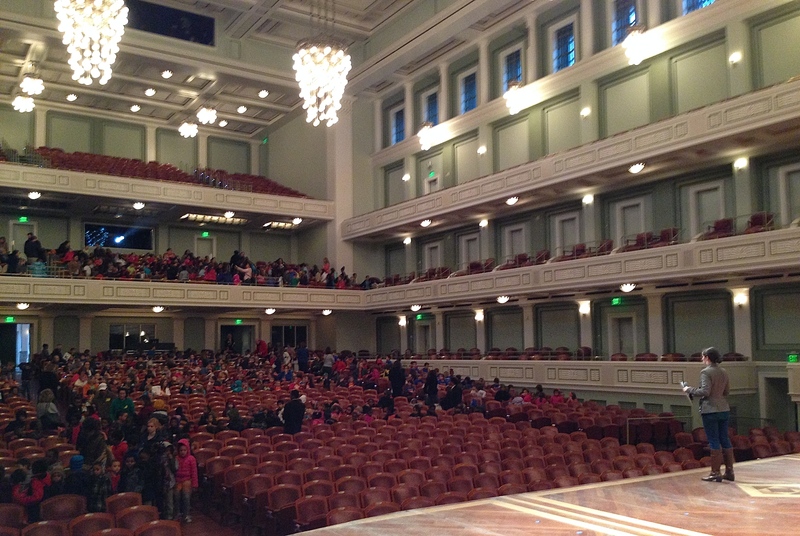 Like many symphony orchestras, the Nashville Symphony performs many Young People’s Concerts (YPCs) each year, bringing the experience of our superb orchestra performing live at beautiful Schermerhorn Symphony Center to thousands of children free of charge. 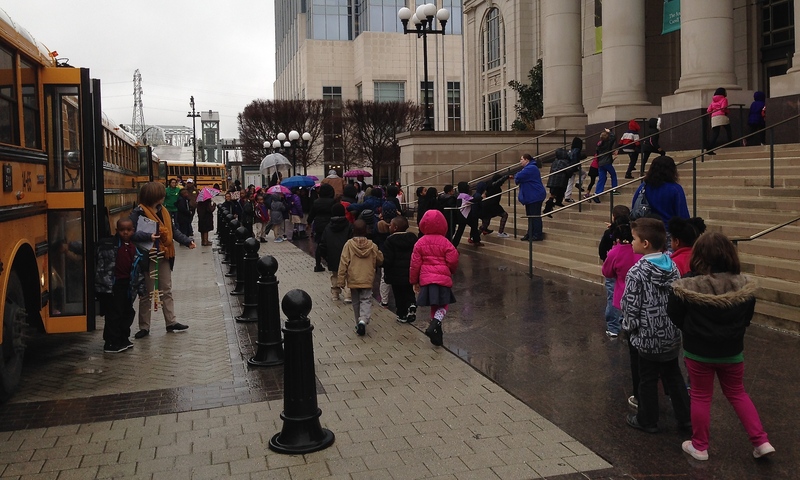 In the 2013-2014 season, more than 20,000 students attended these concerts. Four separate programs are designed for specific grade levels (K-2, 3-4, 5-8, and 9-12), the K-8 concerts are performed several times, and participating teachers are provided with preparatory material (program notes and lesson plans) to prepare their students for the concerts. Our K-8 YPCs are commonly performed as what are called “back-to-backs” – the same program is performed twice in a morning for separate groups of students attending concerts at 10:15 and 11:45. This morning’s event is a back-to-back, with over 3000 students from Kindergarten through Second Grade scheduled to attend – 39 school buses will arrive in two shifts as well as hundreds of homeschool students. It is raining intermittently and the weather is forecasted to turn bitter later in the day – there is talk among the musicians and staff about whether or not we will have to cancel tomorrow’s concerts (a repetition of today’s back-to-back YPCs). It’s nearly 10 am now and only a few buses have arrived, when it seems like all of the remaining buses show up at once, and of course the rain picks up as they pull in. Most members of the orchestra are already on the stage by now. We are a bit short staffed on the volunteers who help with crowd management – several staff members have donned their raincoats and are helping out. I find myself trying to fill in where somebody is needed: greeting a bus here, escorting a group of students into the hall there. Soon everyone has arrived. By the time I make it backstage the concert has already begun and I listen for a few minutes from behind the stage right door before heading up to the light booth to check in with Kelley. 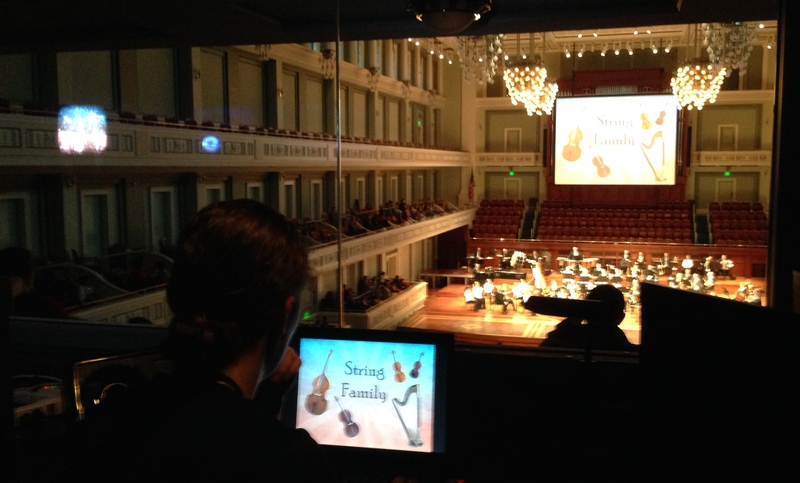 One of the Nashville Symphony’s Community Engagement programs, Onstage is a unique series of free chamber music events presented by symphony musicians for the public. The series is administrated and facilitated by yours truly, repertoire and personnel are chosen by the musicians themselves, and the audience joins the performers actually on the stage of Laura Turner Concert Hall. Usually presented on Tuesday or Wednesday nights, doors open at 5:30 pm and complimentary beverages are served to those attending, with the performance itself beginning at 6 pm. In this intimate setting the symphony musicians not only perform, but also engage in dialogue about the music with those attending. 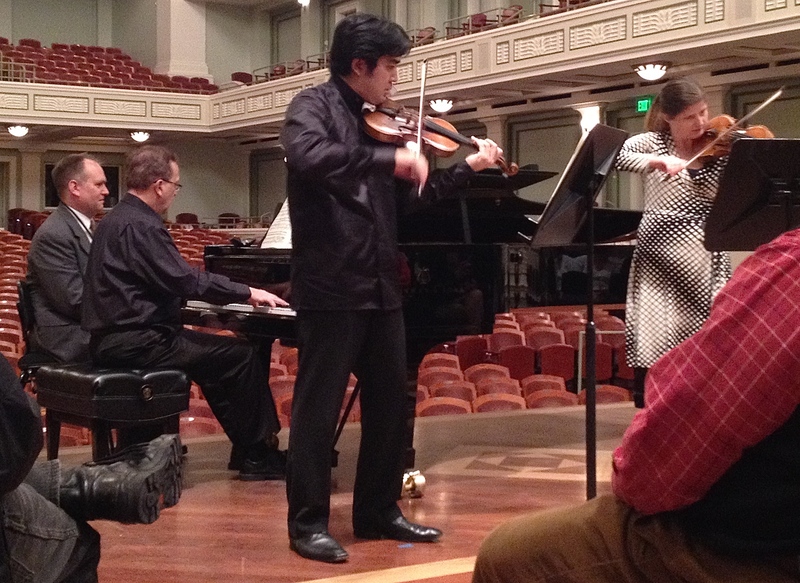 Tonight’s performance features Jun Iwasaki and Louise Morrison performing Prokofiev’s Sonata for Two Violins, Op. 56 (unaccompanied), after which they will be joined by pianist Bob Marler for Moszkowski’s Suite for Two Violins & Piano, Op. 71. 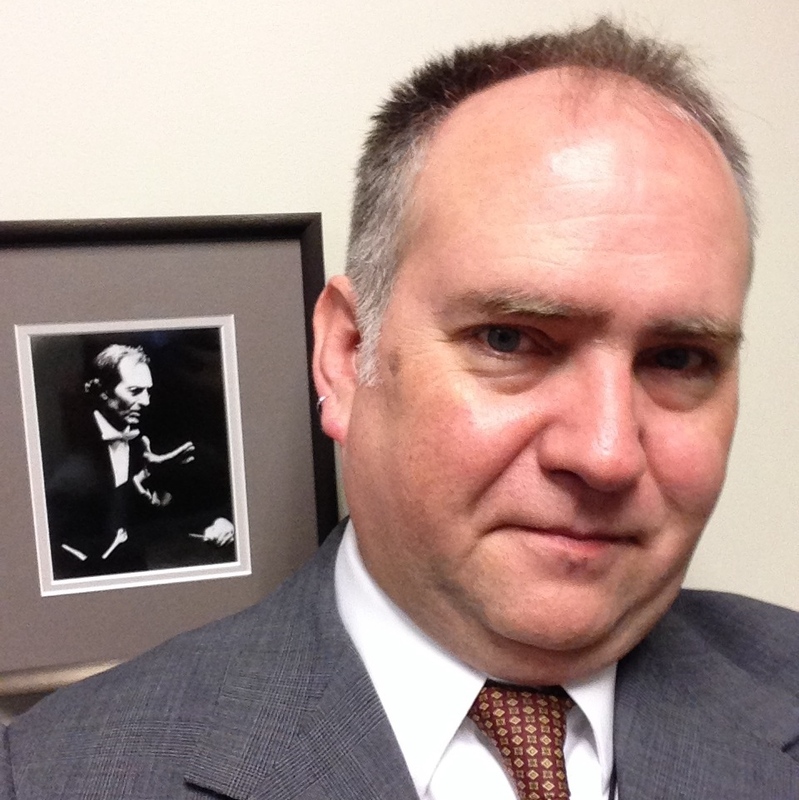 By walterbitner in Chamber Music, Music Education, Nashville Symphony, Nashville Symphony Programs on March 13, 2015 . It took me half a day to read your summary. Probably good for all that the next day was cancelled. It was good – we got several inches of snow the next day and even if the musicians and staff had made it to the hall, very few students would have showed up! I enjoyed this post, very interesting to see what you do all day! Thanks Graham, not every day is quite so packed or long, but it was in fact not an unusual day! Keep up the good work Walter. This is a great review for students to get a glimpse into this career path within in the music profession. Have you considered having a shadow day – like the one described herein- where a high school/university MUSIC student assists you and Kelley? What insight this would offer the student, family AND the student’s music teacher. As a matter of fact, there are music teachers who need to see and learn about the ‘inner workings’ of the symphony ‘s depth of attention to community engagement. I’ll leave these thoughts in your capable hands. Thank you Margaret! And thanks for the suggestions. Our department hosts college interns throughout year-round, and we are in the process of designing a new program called Prelude which will provide the opportunity for high school seniors to volunteer at the symphony to earn community service hours for their Senior Capstone Project. Thanks for the window into your work life. Cool to see th inner workings of your job. For those of us that just show up and play, it is revelatory how much effort it takes to make it all seem so smooth. .. Thanks for making our jobs that much easier! So much behind th scenes stuff to make everyone’s experience delightful AND easy. .. Many thanks for sharing and a job well done! Thanks for your appreciations! The symphony is truly a team effort.